This morning an article ran in the Lincoln Journal Star newspaper stating that one of Schrock Innovations’ local competitors, QuickTEQ computers, is being sued by Microsoft for allegedly intentionally selling counterfeit Windows XP Professional products and improperly using Microsoft’s trade marks. The basic outline of the story is that QuickTEQ sells a lot of refurbished laptops and Desktops. According to the article, Microsoft detected QuickTEQ was selling copies of the company’s Windows XP Professional operating system in ways that did not conform with the company’s licensing rules. Microsoft warned QuickTEQ with a letter, and later sent an undercover investigator to follow up and see if QuickTEQ was still improperly selling Windows XP Professional. After the investigator returned his findings, Microsoft hired Omaha attorney Richard Jeffries to file a suit against QuickTEQ. Exactly What Did QuickTEQ do Wrong? That is hard to say at this point. Microsoft’s licensing rules are complex in refurbished computer situations. QuickTEQ sells refurbished computers that were sold coming off leases, at auctions, or in other situations when companies and government entities are done using them. The article doesn’t say exactly what QuickTEQ is accused of doing wrong, but I was personally really surprised to hear about Microsoft filing this suit. I had heard through the grapevine that QuickTEQ had received a letter from Microsoft about licensing. My understanding from my sources was that the company was taking the letter very seriously. In these situations, Microsoft is likely to ask for a temporary or permanent injunction against QuickTEQ to prevent them from selling any additional licenses. According to the Journal Star, Microsoft is seeking information that will allow them to identify their exact monetary loss in the situation. I am not certian if that means they want a tally of the number of licenses sold, or they want the information about who bought the licenses. 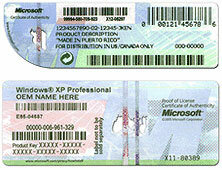 Generally, Microsoft does not go after individual consumers for buying counterfeit software. They prefer to go after the players who they believe are putting the counterfeit software in the market for others to buy. With that said, QuickTEQ has not told their side of the story yet. They did not comment to the Journal Star, and are probably just learning about the suit as well. QuickTEQ and its owner, Kevin Knudsen, are honorable staples in the Lincoln business community and I personally believe there is some misunderstanding here that will eventually be settled out of court. How Can I Tell if My Software is Genuine? That’s a bummer… I hope the company gets through it safely! I am happy that one company has made an attention with this issue. Pretty lame that even this huge organization has been sued by MS.
that is an unfortunate thing for him. It is not really fair that their licensing agreement is so confusing. I actually know of a site where they offered the first person who read the entire “terms and regs” $2,500 dollars and it took 9 months for someone to claim it. So how did they even find out about this possible infringement? I am sure the terms on which the company is being sued will be frivolous. I have heard of some lawsuits by a few companies on licensing issues which sound ridiculous. Payday, there was a big case here in UK last year when a uni lecturer did something similar. Maybe the company is totally unaware of their negligence. Now, all you have left to do is follow me on Twitter and every Friday, I go through and follow people, so if you don’t see it happen instantaneously, I promise you, I will! Have a good rest of the week everyone! That was really a bad time for small company. Maybe the company is totally unaware of their negligence. Company like Microsoft never ever file a case on a little misdeed. Yes it sounds like MS is playing the part of the bully and not really giving this company a fair chance to comply. It doesn’t sound like they are breaking the rules purposely. Operating system licensing would be a tricky issue for a refurbished computer store to deal with. Then again with a company like MS, they have likely lost a considerable sum to software piracy. So you can’t really blame them for trying to be aggressive about any potential licensing issues. What would you do if someone was stealing from you whether it is intentional or not? I wonder how much they will sue them for. This company will most likely go out of business if they continue to sell counterfeit copies of windows. Wow!Really a great sharing with have a nice info…..keep it up this great thought. So, there was a big case here in UK last year when a uni lecturer did something similar.